Arsenal have advanced to Champions League proper with another morale boosting performance. A 5-0 aggregate win over a team like Fenerbahce can give the impression that it was never a contest but don’t let it take anything away from the outstanding performances of the Gunners. As with the first leg, the opening exchanges were always going to be vital and it was important for the hosts to ensure they did not concede. The visitors looked a lot more potent up front with Emenike leading the line in place of Webo, particularly in the opening minutes when the Nigerian was able to drop into space in front of Mertesacker or combine with Sow and others down their right flank. It wasn’t a very comfortable start for Arsenal but they were getting enough bodies into the box to deal with the crosses. The first real threat to goal came in the 12th minute when Jenkinson was dispossessed when he darted infield with the ball just in front of the penalty box instead of clearing it. To make matters worse the youngster clattered with Wilshere which left the central defenders exposed. A couple of excellently timed and executed challenges from Mertesacker and Sagna followed by good reactions by Szczesny kept Arsenal’s lead intact but the signs were there. Thankfully, the Gunners heeded those signs and tightened up. As time went by the midfield’s dominance grew and the hosts began to look threatening. Once Ramsey took his chance in the 25th minute the nerves seemed a lot more settled and it seemed some of the visiting players lost their spirit and reverted to making unforced errors. The goal itself was wonderfully crafted with Jenkinson, Mertesacker, Wilshere, Giroud, and Cazorla playing their parts. Podolski’s through-ball was delicately lethal as, in combination with Walcott’s ever looming threat, it forced the defender into a desperate sliding tackle. The ball fell kindly to Ramsey who scored with a first-time strike. You might say Ramsey was lucky with the way the ball landed at his feet but watch his run and you’ll have to accept the Welshman made his own luck. He was the deepest of the midfielders when Cazorla had the ball as he hovered around the centre circle. From there he went on a sprint behind the attentions of the visiting players who were watching the ball. Ramsey covered over 40 yards to be there if the opportunity arose. The eye to see that space, the desire to make that run, and the engine to execute it are all worth applauding. There are a couple of important points related to this goal that I want to discuss. During the 2011-12 season Ramsey was making many such runs after his return from injury. Unfortunately, that season his teammates were just not prepared for his movement and the ball rarely came to him even when he was completely free in front of goal. After a few weeks the players started finding him a bit more but by then I thought Ramsey was putting too much pressure on himself and lacked in confidence as he started rushing his shots. This led to some excellent chances being squandered and it only made the pressure worse. That’s where I thought the lad lost his confidence and his spell of poor form started. This year, from pre-season onwards, we’ve seen him play with the same exuberance he once had and now his teammates are combining with him. The physical, technical, and mental qualities he has are absolutely exceptional and these goals early in the season can drive him towards fulfilling his immense potential if he remains fit. The second point was the chaos that we saw in the Fenerbahce defence. Their backline was often out of shape and the gaps between their lines were too wide and easy to exploit. It was reminiscent of the kind of mistakes that Arsenal used to make in the not too distant past and the freakish moment with the defender putting the ball in Ramsey’s path resulted from that mess as much as it did from Arsenal’s qualities. It was another excellent example of how not to defend. It’s important to understand this because it helps in differentiating between a good defence and an average one. Sometimes a team could defend terribly and still hold on to a result and on other occasion they might defend resolutely but succumb to an unfortunate goal. Whether it was the defending or a matter of luck can be determined by analyzing such patterns of play. With that in mind I think it safe to say that Arsenal have improved their collective defence considerably and last season’s good work has not been lost. Sure there were problems. For instance, Emenike was able to find space far too often and easily. He was also able to run past defenders who got too tight to him when it wasn’t needed or advisable (Sagna in the 39th minute being a great example). Szczesny too had some iffy moments when it came to his judgment and tendency to come off his line. Sometimes the players got in each other’s way and, on occasion, Fenerbahce were able to advance from defence to attack with discomforting speed. However, the team did not collapse completely and made up for the weaknesses through other strengths. The offside line, for instance, did a good job of breaking down a number of the opponents’ moves. Szczesny made some saves when he had to and the defenders made the tackles and clearances when they had to. Defending is about creating layers of protection so that there is a failsafe in case of an error. I have covered Arsenal’s defensive issues in depth for three years now and, since that run at the end of last season, it finally seems that the Gunners are heading in the right direction. That’s not to say all problems are solved – I can’t see Arsenal play with as much defensive assurance and United and Chelsea did on Monday, for instance – but after a long time it seems the problems are actually solvable and worthwhile progress is being made (That’s another reason why the Villa game was so, so frustrating). The way Arsenal controlled the game after taking the lead was commendable. There were one or two scary moments but those will always be there at this level. The key was that the team found a way to deal with them and minimize the clear cut opportunities. The second half was mostly all Arsenal. It was again a half of football that will be easily forgotten but that ability to take the life out of the game when you’re in control and not giving your opponent any sniff is, in itself, immensely enjoyable and vital to long term success at the highest level. And many fans will of course remember Ramsey’s second goal which was another beautifully orchestrated move with a matching top class finish. This time it was the other full-back, Monreal, who won the ball back. Sanogo and Ramsey shared passes before the young striker found Wilshere. Jack played an excellent first-time ball to Gibbs who was in a striker’s position. Ramsey was around the centre line when the move started but he put himself in the box and finished with aplomb. Podolski’s injury, and possibly Ramsey’s too, were the big negatives on the night. The fact that Arsenal could have done better with some chances and some of the defence related observations mentioned above show plenty of room for improvement as well. Szczesny: Made two very good saves – first from that rebound off Meireles in the 12th minute and then from Emenike. Had some iffy moments as well – when he came out and fluffed his punch, the way he came off his line and was in a no-man’s land against a header (which was ruled offside and only hit the bar anyway), and the Emenike booking where it was inches away from being a penalty. Did a good job of handling the shots and crosses that made their way to him. Jenkinson: Was guilty of making the wrong choice in the 12th minute that put the team in trouble. Other than that it was a decent game from the youngster. Almost scored at the end with another excellent strike. Sagna: Made some useful interventions in the box and I liked the way he attacked the ball even near the centre line. Of course, that tendency to attack the ball was used by Emenike to turn past him and that’s where defensive know-how – when to use your skills and when to hold – shows through. He got it right more often than not so it should go down as another impressive game in an unfamiliar role. Mertesacker: Excellent tackle in the 12th minute and many other useful clearances/interventions in and around the box. He did struggle a bit in the opening minutes when Emenike was dropping into space in front of him or running into the left channel. Distribution and composure at the back were commendable, as usual. Monreal: I thought he tucked in a bit too narrow at times and was a bit high up the pitch in the opening minutes. Made some useful forward forays and Giroud should really have scored from one of his square passes in the box. Steady defensive game but he can do better. The back five were a bit more exposed in this game, partly due to mistakes/tendencies of their own and partly due to the midfield being farther away than recommended. But they played for each other and kept things relatively tight. The goalkeeper didn’t have too many big saves to make and he made them when called upon. Ramsey: Easily the MotM. Was there to make clearances in the box and to score goals at the other end. Showed everything to be a complete midfielder. Cazorla: Would have been the MotM if Ramsey hadn’t been that decisive. Simply sensational on the ball with a top notch work rate to boot. Good time and way to get towards his peak. Wilshere: I thought he was playing within himself, i.e. holding himself back for tactical and possibly fitness reasons. There are still some mistakes in his game from a defensive point of view but he’s another player not close to his best yet and not playing in a system that’s best for him. From that point of view it was a good utilitarian performance which showed glimpses of his ability. Arsenal’s midfield was the main difference between the two sides over the two legs. The Gunners were able to keep the ball for longer periods, they were able to dictate the tempo and shape of the game, and the midfielders made and finished more chances going forward while also helping the defence admirably. Walcott: Didn’t get a goal or assist but his presence was always a threat and contributed to the goal. Giroud: Had some chances where he could have done better – When Ramsey played him in on the left, the shot he took from outside the box instead of finding Wilshere’s run, and Monreal’s square pass – but it’d be harsh to focus only on that. Work rate was again excellent and he brought others into play regularly through his movement and link play. Podolski: Excellent work for Ramsey’s first goal. Could probably have done more to help Monreal early in the game. Unfortunate to pick up that injury when he looked in good form. The Arsenal forwards were able to combine with their teammates in a way that Emenike or Sow weren’t able to. There were many Arsenal moves that involved four or more players with the strikers playing selflessly. Subs: Sanogo played his part in the second goal but he still looks very, very raw. Gibbs picked up a good assist. Miyaichi just got a few minutes. Wenger: The first major early season task is over and it looks like his players are working hard to minimize their defensive mistakes. We haven’t seen the handbrake come into play, nor have the players struggled in the opening minutes to give the opponents major advantages. The next big test comes as soon as this weekend and we’ll know if the quest for balance has truly taken some forward steps. It’s less than a week since the first leg was played last Wednesday and almost everything I had to say was covered by the pre and post-match write-ups. There isn’t much to add from a tactical point of view as nothing has changed, but that doesn’t mean another comfortable win for the Gunners is guaranteed. Fenerbahce need at least three goals. Normally that would be considered a big ask but Arsenal’s defence at home has been weaker than most, if not all, of the big teams around Europe. They’ve already conceded three goals against Aston Villa in the only competitive fixture at the Emirates thus far this season. Last year Schalke scored two and Bayern three. Even the likes of Fulham and Newcastle scored three at the Emirates. None of the teams however, managed a scoreline that would eliminate the Gunners from the Champions League, but the fact that Arsenal can leak goals at home would not be lost on Yanal and his men. As we saw in the return leg against Bayern last year, an early goal for the visitors can make such a tie very tricky because the team leading the tie can get caught up in two minds while the one chasing it has nothing further to lose and all to gain. It’s not always easy for the club with the upper hand to decide whether they should play it safe of if they should go for goals. In that sense, Wenger’s tendency to approach almost every game in a similar style is helpful. Arsenal should just play the way they’ve played in the last two games. Remain cautious and well-structured but always look for goals. Any goal for the Gunners will make it that much harder for the visitors. The players have to trust their technical skills and their training. They will advance if they can execute this. They’ll have trouble if they suffer initially and the crowd gets on their backs. Fenerbahce are a better team than we saw in Istanbul. Don’t forget the hosts did create a fair number of chances as that game progressed, they just didn’t hit the goal as often as they needed to. Any drops in concentration or moments of anxiety can quickly escalate into trouble for the Gunners. Wenger has said he’ll not rest players, which is not surprising at all because there are precious few options. Koscielny and Wilshere could start. If it were up to me I’d rest Sagna and Ramsey, two players who give a lot physically in each game. Szczesny – Jenkinson, Mertesacker, Koscielny, Gibbs – Rosicky, Cazorla, Wilshere – Walcott, Giroud, Podolski. There is an element of risk with that line up because Arsenal could be short of bodies in some areas if they don’t have the engine of Ramsey in the middle. It’s quite likely that Wenger will go for the safer option and give the Welshman at least an hour and only take him off if the tie seems secure. Sagna is also one of his favourites, and understandably so, so I won’t be surprised if he too starts with Jenkinson on the bench. Leaving Podolski out will be extremely harsh and might even be a tad demoralizing for the player. Wenger can rest Rosicky or Cazorla if he wants to retain Podolski in the side. The Arsenal manager will hope that his players do the job in the opening hour or so and give him the chance to give the likes of Monreal and Sanogo another run. It won’t be possible if Fenerbahce have scored a couple of goals by that time and found some sort of rhythm. This game can create excellent momentum going into the North London Derby if the Gunners produce a dominant performance resulting in a good win. There will be serious question marks over their chances in that game if they barely scrape through. And it will be mayhem if they somehow manage to go out despite taking such a lead. Over the last year or so, every time I’ve thought Arsenal are doing well a nasty surprise comes along. That has forced me to temper down my expectations. Any result that ensures qualification will suffice. Sometimes there are games where both teams play well but one side has some special qualities that prove decisive in a manner that the score seems one-sided. Arsenal’s 3-1 win at Craven Cottage could fall into that category. I thought Fulham performed admirably without having enough quality in the final third. They attempted 477 passes with 87 percent accuracy (same as Arsenal’s). The hosts created 16 chances with 7 shots on target. The difference in possession was marginal and they were as good or better than the Gunners on almost all stats that measure defensive performance. But the visitors were the better side. They had that quality in the attacking third of the pitch that made all the difference. The quality of chances that Arsenal created was much better as was their finishing. I also thought Fulham might have underestimated the Gunners a wee bit. They were a bit too gung-ho from a tactical point of view as they often attempted pressing higher up the pitch. Unfortunately for them, Martin Jol’s side showed the kind of weakness that Arsenal have displayed in the past – they lacked cohesion when pressing. Arsenal’s first goal had a bit of fortune about it when Ramsey dragged his shot (once again!). It fell kindly to Giroud who should get credit for being ready and reacting quickly, calmly, and precisely. But it was the second goal that showed Fulham’s weakness. 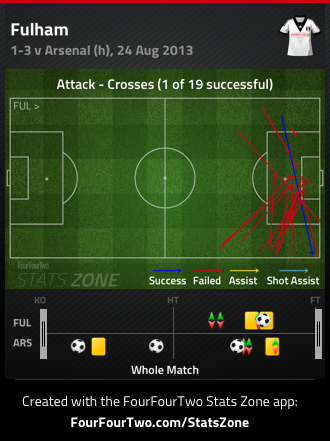 The Gunners strung together 16 passes in the build up to Walcott’s shot with around 30 seconds of possession. It started wide on the right from a free kick, went all the way back to Szczesny, came up the left to Podolski, then went back to Mertesacker, before Podolski’s horizontal movement opened the angle up. Fulham were pressing but it was reactive and uncoordinated. The technical qualities of the Gunners, their patience, and composure all contributed to this attack. But thinking from Martin Jol’s point of view, this was way too easy for the Gunners. Normally, Fulham either set up just inside their own half or they really push up as a unit and press the ball in the central third of the pitch. In this game the gap between their forwards and the defence was too large on numerous occasions. It made Arsenal’s job easier and some of their one touch passing was a joy to watch. The key aspect, to my mind, was their ability to keep bodies in vital central areas inside and just in front of the box. The central part of the pitch in front of the box is often the creative hub, particularly for high quality chances. Look at the chances created by both sides from open play. The Gunners have created most, if not all, their chances from that zone just in front of the penalty box or inside the box. Fulham have created chances from wide areas and when they did get close to the box the chances they created were often from passes that were sideways or going back (away from goal). In fact, if we look at shot taken by both sides we see that Fulham only managed 4 shots from inside the box and these came from only 2 moments of penetration. There was that double save by Szczesny in the first half and then the Berbatov shot followed by Bent tap in. 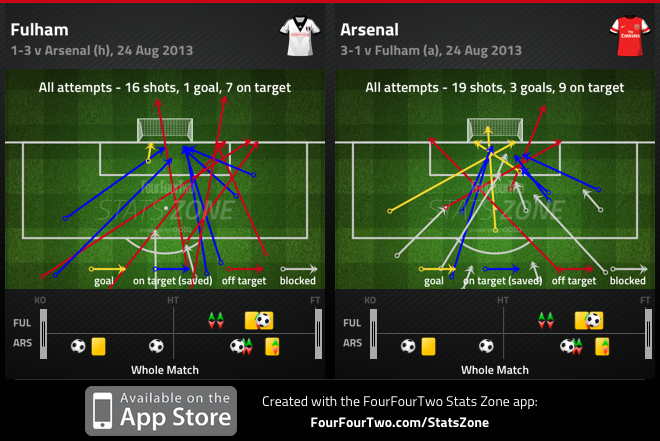 In contrast, the Gunners had plenty of shots from inside the box in good areas. When we note that Fulham’s shots from inside the box were moments of genuine concern, the benefits of minimizing such opportunities becomes obvious. It wasn’t about one or two players doing a great job defensively or one DM sitting in front of the back four. This was a collective effort and, as Wenger said, a game of numbers. Arsenal compressed the space between the lines and got tight to players in key areas. Fulham didn’t have the one-touch passing and mutual understanding needed to break such a defensive approach. Look at the black box in front of the Arsenal penalty area. There’s hardly anything played into that zone. It’s worth noting that fewer passes have been played there instead of many unsuccessful ones. 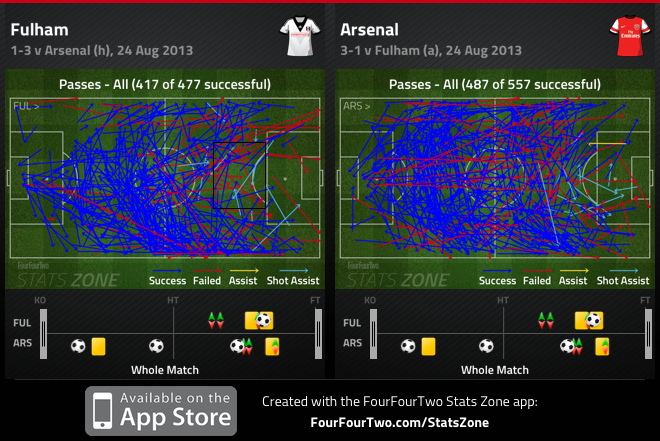 This means the Gunners forced Fulham wide by having players in that area thus discouraging passes into that zone. After forcing Fulham wide Arsenal did an excellent job of attacking crosses and the defenders deserve credit for this (although some blame must also fall on the hosts’ inability to get their act together on this front). Only 1 of Fulham’s 19 crosses was successful and that too because it was picked up by a teammate near the corner flag on the far side. Having numbers in the right areas gave Arsenal defensive stability and assurance. The back four weren’t forced into hoofing the ball up the pitch to thwart danger. This stability also helped the team going forward. For instance, the third goal came from a controlled long pass by Mertesacker after he recovered possession inside Arsenal’s penalty box. Despite Fulham having numerous bodies forward and Arsenal having all 11 players well in their own half, Mertesacker was able to pick up that ball without much pressure thanks to the team’s shape. It allowed him that little bit of time to play the pass instead of forcing him into a desperate clearance. Such a defensive approach also countered the skills of Berbatov as he had very little room to work with. Either he just didn’t have time and space on the ball to do something effective, or his touches and flicks went to a player who was offside, or the Gunners were first to his attempted through-balls or clever passes. Arsenal’s back line was excellent for most of the game. They did slip up once when Sagna and Jenkinson were deeper than Mertesacker, playing Berbatov onside. The Bulgarian made the most of that half a second he got as he turned and shot forcing a save that only delayed the goal by a few seconds. If anything, it just showed how good a job Arsenal did of keeping him quiet. At this point it’s worth noting that Riether’s pass to Berbatov is not recorded as a cross by Opta. This is where the technicality of stats (angle of pass perhaps?) gets complicated as it would look like a cross to many casual observers. This article might give the impression that the Gunners were superb defensively. So I have to clearly state that that’s not really the point. The key is to understand how the team improves by making some adjustments and how results are achieved when the players and the manager get it right from a tactical point of view. This was not the kind of performance I’d want to see against a big team that can sustain pressure over a long period of time and has many players who can produce something out of nothing. But this was exactly the kind of performance that gets three points in the kind of games a club like Arsenal should be winning irrespective or transfers and player availability. Szczesny: Spilled Taarabt’s shot but did well to make the second save. Could only parry Berbatov’s instinctive strike into Bent’s path but it would be harsh to blame him for the goal. On the whole I thought it was a decent game from the Pole as he came for the ball when he had to, made the right choices, and didn’t make any major errors. Jenkinson: Very busy game for the youngster but I thought Fulham didn’t test him as much as they could have, which is to say Taarabt wasn’t in the game as often as Jol would have liked. Was lucky to escape a yellow card early in the game. At the end of the game I did feel this was better from Jenkinson than I’ve seen in some recent games. Sagna: Good presence in and around the box, kept things simple, and provided good covering pace on the occasion or two when it was needed. Mertesacker: Played his part in the build up to the second and third goals with two useful vertical passes. Another player with excellent presence in the vital defensive areas. Should probably have been tighter on Berbatov instead of trying to play offside. Gibbs: He too had a busy game, more so because Fulham played down his flank a lot more often. Wasn’t as efficient as other defenders with his passing but he was also a bit more ambitious. The back five had a pretty good game and made the most of the support they received from the other outfielders. Arsenal were safe for the most part and it was good enough for a comfortable win. Ramsey: Was everywhere, again! Exceptional energy and excellent all-round performance. Should probably get the assist for the first goal. I liked the way he stayed in good areas around the central defenders for large durations and chose his moments to advance carefully. Cazorla: Excellent at keeping the ball and moving it in all directions. Was involved with almost everything Arsenal did going forward. Didn’t win any of his 6 tackles and only 2 of his 5 dribbles, which confirms he’s still not at his best. Rosicky: Another player who was there all over the pitch without really being noticeable. Played for the team without trying anything too spectacular and thus contributed to the balance. That said, the first time chip pass for Theo in the 10th minute was something special. The midfielders showed good game intelligence. This led to a well-structured defence without really compromising on offensive potential. But we must also note that they benefitted from Fulham playing two forwards. Had the Cottagers played three midfielders it might have been a different game altogether. 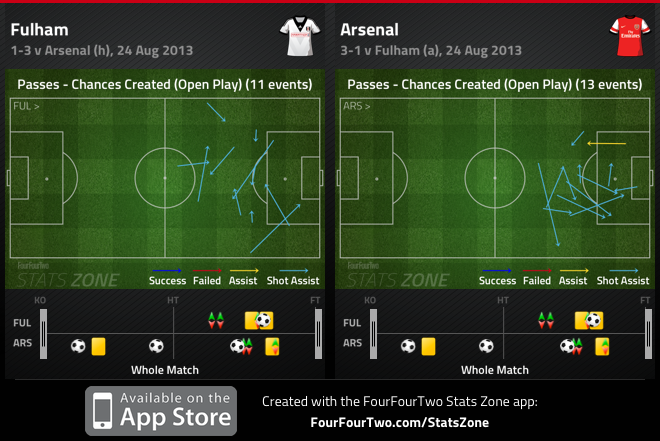 Arsenal also didn’t miss the extra midfielder because Fulham were one short as well. Santi through the middle worked really well in this game and it’s something Wenger should try more often in games against mid-table teams or those below them. Walcott: Tried to take responsibility and took players on. Got into good areas and was linked with a number of moves either creatively or by getting on the end of passes. His finishing, as I’ve noted before, is becoming a bit of a concern. Wasn’t really called into defensive duty but the double save in the first half did come when Riise had pushed really high up without anyone marking him. Giroud: Another game, another goal. That’s a good habit to get into and I liked the speed with which he reacted and the assured nature of the finish. His control and pass for the third goal was admirable too. Podolski: MotM in my opinion because his contribution was decisive. There aren’t many players who take those kind of chances. Don’t get fooled by the way he made it look easy. Arriving at the box at the right time, striking the ball cleanly and quickly, and placing shots accurately are highly valued skills. His defensive contribution was notable too. The forwards found some space as Fulham were a bit stretched and lacked an extra midfielder, and they made good use of this space. When the opponents give you the chance to play to your strengths you’ve to make the most of it. In this game the Arsenal attackers did just that. Subs: Wilshere got half an hour to maintain his continuity and give Rosicky a break. Monreal continues his pre-season with some actual game time. Should probably have done better to close Riether down. Sanogo looked physically strong and enthusiastic but also inexperienced and raw. Wenger: The defensive approach to this game and the change to formation with Santi coming into the middle are the kind of changes that get vital points while resting key players and dealing with injury related absences. Arsenal need such performances and results on a more consistent basis. This paragraph from the match preview on Arsenal.com aptly captures my sentiments. Arsenal’s season is only 180 minutes old but it has created enough oscillating emotion to fill the first month or so. An everything-went-wrong 3-1 defeat at home to Aston Villa was followed by a could-not-have-gone-better 3-0 win at Fenerbahce. But football at this level is as much about consistency as anything else. One result really doesn’t mean much and the team has to string together a run of form before fans are satisfied and the perception about Arsenal’s chances this season takes a more positive outlook. The Gunners have another away game today and that provides an opportunity to build on the good work in Istanbul. Fulham have made a number of interesting acquisitions from their point of view. We’ll have to wait and see how soon Martin Jol is able to integrate all their players into a smoothly functioning unit. At the moment I do not know what to expect from Fulham. Having said that, the Villa game should serve as a reminder that any team can prove to be a hurdle in this league if your level drops. The Cottagers could be as rudderless and sluggish as Fenerbahce or they might be as resilient and resourceful as Villa were. The Gunners will have assume they’ll be up against a strong team. Martin Jol sets his team up to play football and most of their players are capable of passing the ball around. The Gunners will have to be very careful and cohesive with their pressing and their off-the-ball shape or the hosts will stretch them before finding a way through as they did last season. The Cottagers played 10 passes in their own half before quickly breaking forward down the right after Arsenal’s pressing cohesiveness broke down. With players like Taraabt and Berbatov, they also have a fair amount of trickery in the attacking areas. Even their set-piece threat cannot be discounted. Matters will only get tougher for Arsenal with a makeshift backline in place. As with Villa last week, if I were a Fulham player or fan right now I’d strongly believe something can be taken from this game. The Wilshere-Ramsey partnership will not mature into a dominant, game-controlling force in a matter of days. They did well against Fenerbahce but a lot of it was down to the opponent’s weaknesses as well. Taarabt and Berbatov, Ruiz too if he plays, are extremely wily mobile players who can cause all sorts of problems if gaps appear in front of the centre back pairing. Once again, just like the Villa game, I’ll be surprised if Fulham don’t score in this one. Can Arsenal get two or more goals to win? Jol has added some physicality and defensive-mindedness to his squad with acquisitions like Parker and Boateng. Last year it seemed they didn’t seem to have the right balance but if things go according to the Dutchman’s plans it should be a lot better this year. The biggest attacking avenue for the Gunners could be down their right flank if the youngster Briggs starts at left back. Walcott could again become Arsenal’s key attacking weapon but in this game I’d expect someone like Parker or Sidwell dropping deeper and wider to provide cover, particularly if Taarabt stays higher up the pitch. The central areas in front of the Fulham penalty box could get very congested if Cazorla moves inside and their central defenders are excellent at defending crosses. Breaking through is going to be a challenge for the Gunners and there could be periods of frustration that will have to be dealt with patiently and with tactical maturity. Sometimes in such instances, younger players with an attacking mindset have a tendency of trying too hard and they lose touch with their defensive responsibilities/positioning. Fulham have the quality to punish such errors. While I did say Arsenal are likely to concede in this game, the best possible scoreline for the Gunners also seems to be a 0-1 win, something they achieved last season. The midfield will have to be exceptional for that to happen but that is also the area of the pitch where Wenger has his best players. If they can’t deliver, would it be fair to expect more from others? There is a need for rotating some players but I don’t know if the manager has enough choices. After a long trip in Europe we’ve often heard the “players lacked sharpness” line of defence for a disappointing performance. It will only add to the vitriol amongst fans if we hear it again after this game. Hopefully, it won’t come to that. Szczesny – Jenkinson, Sagna, Mertesacker, Gibbs – Ramsey, Rosicky, Wilshere – Walcott, Giroud, Cazorla. Podolski could be drafted in to give one of the midfielders a break. I doubt Monreal is ready for a start right now. There really don’t seem to be any other genuine alternatives for rotation, which is also a concern because any further injuries (Murphy’s Law) could really leave the side struggling. Playing a low risk conservative game with patience, and taking the big chance when it comes, seems like the best strategy for the Gunners. That was my first thought after the game. This was going to be a test of Arsenal’s mental strength and they’ve come through with flying colours. Before the game I doubt many people would have bet on a three goal victory for the Gunners with a clean sheet to add extra sparkle to the result. While it did seem that Fenerbahce didn’t go with the right formation and lacked cohesiveness – will not surprise me if their manager doesn’t last the season – the performance from the visitors was professional and efficient. As expected, Wenger made only one change to the starting line up from the previous game with Cazorla coming in on the left. I was impressed by the way the team started out confidently and controlled the game for large periods. It’s true that the first half wasn’t a spectacle for the viewers, you might even say it got frustrating at times, but Arsenal were almost always in control. The midfield balance was under scrutiny and it wasn’t perfect in this game either, which is understandable. Ramsey and Wilshere are not going to develop a tactical defensive brain overnight. But they were helped by the fact that Fenerbahce just didn’t have a plan to use that space. Even when they did get into the hole in front of the central defenders – Moussa Sow dropped in there quite often, for instance – the choices made by their attackers were inefficient and individualistic. In a way I was surprised at the way the hosts played. Instead of a technically competent and cohesive continental unit they put forward a poor imitation of some of the smaller, more physical premier league clubs. It didn’t seem like the best approach given the kind of players they had but Ersun Yanal can also point to numerous unforced errors from his wards as the source of their problems. It won’t trouble Wenger though and shouldn’t take anything away from Arsenal’s calm and composed display. They had to be confident yet cautious in the opening minutes and the Gunners produced just the right mix. I liked the determination to avoid mistakes and the desire to still play the right way. All the goals came in the second half with the first one being the most vital and enjoyable. Ramsey’s vision was penetrating and execution precise. An alert Walcott raced onto the resulting incisive ball before squaring it across the face of goal. Gibbs arrived at the right moment and knocked it in, doing well to direct a bouncing ball goalwards. Given just how quick Arsenal’s fullbacks are and their advanced positioning, this is a kind of goal I would like to see scored more often. It can and should also work in reverse with someone like Gibbs or Monreal making a run in behind and squaring it to Theo at the other post. The second goal was a bit fortuitous with the Keeper’s mistake, and to be honest I’m a little surprised Ramsey doesn’t strike the ball as cleanly as he used to, but the way he made and utilized that yard of space on the edge of the box was commendable and again something I’d like to see more often. In fairness to the players though, most opponents will not leave their back four exposed as Fenerbahce had done on that occasion. Arsenal’s third came from a delightful crossfield ball by Cazorla whose brilliance was matched by Walcott’s run and control. Theo had been terrorising the hapless (and helpless) Kadlec throughout the game and again forced a mistake from the fullback. Giroud placed his penalty well. The Gunners had chances to add more, and indeed the hosts could have reduced the deficit on more than one occasion too. Wenger’s side did seem to drop too deep after scoring and gave the hosts a lot more space than was necessary. There were some casual touches and unnecessary backheels in critical areas in front of the defence that might have caused more problems against a different opponent. But these are not new issues and I don’t want to dwell on them in this moment to cherish. Szczesny: Made a couple of very good saves late in the game. Showed good concentration and bravery. Still I’d not say this was more than the kind of display that is expected from a Keeper at this level. Sagna: Good to see he looked fit. Played an hour or so at centre back and didn’t look out of position except a few moments when he didn’t seem quite sure whether to get tight to the attacker or not. He always gives everything and is willing to put his body on the line but I got a feeling this is not a position he will enjoy if he has to play there for a run of games. Mertesacker: Won numerous important headers in the box. Looked comfortable even after switching to the left side of the defence. Maybe he could have done more to keep the team compact later in the game? Koscielny: Was looking strong and composed till he picked up another unfortunate injury. I’m not glad he got injured but given his ban from the weekend’s clash, better he than any other defender. Gibbs: Well-taken opportunistic goal and efficient contribution on the flank as he made good use of his speed. There’s more to come from him if he can stay fit for the whole season. Jenkinson: Showed good energy on the flank and got into interesting attacking positions. Put in one or two good balls as well. Did make some minor mistakes defensively but usually had players around him to help out. Excellent left footed strike right at the end. The defenders had a decent game without being special. Could have done more late in the game but they did make sure the chances conceded were not of the gilt-edged variety. Ramsey: MotM easily. Superb pre-assist, good goal, untiring effort all over the pitch in attack and defence. Did the simple things and produced the decisive moments. Rosicky: Might not get a great highlights package out of his display but I thought he brought maturity and game-intelligence to the side as he kept plugging holes all over the pitch. He was there where his teammates needed him doing the simple bits and working hard for the team. Wilshere: It seemed to he was the more conservative of the midfielders and didn’t advance forward as often, which was commendable. Still had some bright moments in attack like the time he set up Giroud or the way he burst into the box and got his shot away. Did lose the ball at times when he shouldn’t have. Another good learning experience for the youngster. Cazorla: He is still some way off his best, and yet he’s so good! That pass for Walcott and a couple of others were really memorable. Another player whose work rate and composure helped the team tremendously. There is a problem of balance in the midfield but we must not lose sight of the fact that Wenger has some exceptional players and they’re all capable of producing a lot more than we’ve seen from them this season, or even in the last. The potential should be noted and appreciated. It’s also interesting that Wenger seems to be asking Wilshere to hold more rather than Ramsey. It could be down to the Welshman’s stronger engine and ability to cover ground. While coming at the loss of Wilshere’s dribbling and vision in tighter advanced areas, this could be a decent short term solution if both adapt to their respective roles. Giroud: Work rate was again excellent and his movement in all directions continuously helps his teammates. I thought he should have shown a bit more desire and anticipation in the box. Penalty was calmly dispatched. Walcott: Got more time and space in this game and always looked a genuine threat. Don’t know if winning the penalty counts as an assist officially but in my book it’s two assists for Theo. Since pre-season I have felt he has lost his composure and scoring ability to some extent and this was a game where he could have picked up a goal if he had last season’s form. Did a decent job when he dropped into the deeper areas to help the defence. The attackers had a good game. Not the kind many will fondly recall at the end of the season but it should help their confidence and that of the team. Subs: Monreal and Podolski had very little to do. Wenger: Had to ensure heads didn’t drop and did. Choices were limited and it was about getting the basics right and then hoping his players’ quality shows through. He knows if his team doesn’t concede they’ll always be in with a chance of winning games, just have to keep on working on cutting out the gifted goals. It’s tough to say with a high degree of certainty but common sense suggests a lot is riding on Arsenal’s qualification to Champions League proper. The financial benefits of getting into the lucrative competition are obvious but even the possibility of adding top quality players to the squad might hinge on advancement in this elite competition. Arsenal have had a tougher draw than most Gooners would have hoped for and the trip to Turkey is likely to be a stiffer test than some of the group phase ties that the Gunners have played in recent years or many games in the Premier League. After the Aston Villa performance and given the threadbare nature of the squad at Wenger’s disposal this is not a game many will look forward to with great confidence. Yet it is confidence that the players need. The Gunners have to go out believing they can win or get a favourable result with an away goal or two. In recent times confidence has been a problem. Either the team starts out in a diffident mode and is out of a key contest in the opening 20 minutes or it tends to lose its way midway through the game, even after taking a lead, as the players aren’t quite sure of how to proceed. Interestingly though, sometimes Arsenal do better in away games than they do at home. Last season’s home defeats against Schalke and Bayern were hugely disappointing but the away performances were much better. The key difference was down to the approach of the team. In the away games they took a much more conservative approach and defended as a unit. The same tactic would be advisable for this fixture, but without the presence of naturally defensive minded players in midfield it’s going to be tough even if they sit deep. Fenebahce are a team full of excellent players that have experience at the highest level. Admittedly, the names aren’t all household stars but few serious followers of the game will discount their abilities. This is important because they will play with genuine belief, particularly with the fanatic home support behind them. I expect them to suss Arsenal out in the opening exchanges and then come hard at the Gunners if they sense any weaknesses. This could turn into a painfully long game if Wenger’s side betrays any hints of diffidence (borne out of tactical chaos and not individual mental weaknesses) which might result in the defenders lumping the ball long and the side enduring attack after attack. Hopefully, the technical abilities of the midfielders will prevent this situation and will also allow the Gunners to express their own capabilities going forward. They will have to endure a stern physical test if they are to establish their ball-playing rights. As Mertesacker said, the first 20 minutes could be vital. Arsenal have to avoid conceding a goal in that period. Normally, getting one would be considered beneficial but after the Villa game it’s not so easy to assume that anymore. Set-pieces and counter-attacks are two standard routes to the Arsenal goal that many opponents try to exploit. This shouldn’t be very different. But Wenger’s team can minimize the probability of conceding by maintaining the structural integrity of the defensive unit as a whole. Two banks of four in themselves are useless. Defensive shape is not about pretty lines but about organization that covers key spaces and adds multiple layers of protection. Players forming neat lines without any reference to the opposition’s movement or the position of the ball will amount to nothing. The simple test for this is to observe whether the opponents are having to work hard to create openings or if they’re able to pass the ball around with ease while the visitors chase the ball in desperation. Will we see the Ramsey-Wilshere partnership at the heart of midfield? It is certainly a work-in-progress and one that will invariably lead to defensive problems. Wenger might deem it’s a risk worth taking if it gives the players more experience and hastens their development, particularly that of young Jack who, despite all the hype, still has a lot to learn and prove. Playing deeper, in close proximity to their teammates, could lessen the impact of their positional and awareness issues as cover might be available. Nevertheless, it will be a surprise if Fenebahce don’t go into this game thinking they can get past the first and second line of Arsenal’s defence more often than they should. In attack, the Gunners should again have enough to create some chances if they don’t get in each other’s way. There is no point in all the midfielders rushing forward. One of the weaknesses of Arsenal’s attack from last season carried forward to this is that there are too many players who want to run with the ball and make something spectacular happen. There isn’t enough movement and understanding without the ball, which is where the truly special actually comes to life in football. The potential is definitely there as the individual quality of most players is unquestionable, and I have no doubt Wenger is constantly working to unlock the potential that exists in them. How soon will he find the synergy remains to be seen. On a more specific note, Walcott could be a big player for Arsenal in this game if the Turkish side come at the Gunners. In such a case he could get a lot more space to run into. Even then the midfield has to show the composure, vision, and precision to make use of those split second opportunities. I also believe Giroud will get opportunities in and around the box to score and to create. The way he linked with Rosicky in the previous game was a positive sign in search for attacking partnerships and combinations. Arsenal’s squad travelling to Turkey seems strong enough but we don’t really know how many gambles are being taken here. We might see a couple of players start but not finish the game and that could affect the teams concentration and balance. Even if there aren’t any short term complications the doubts about long term fitness implications for key players will always exist when it seems individuals that aren’t completely ready are being made to play. I don’t know if Wenger can make too many changes to the starting eleven that took the field against Villa. Cazorla, who seemed to lack match-fitness in that game, or Podolski might come in for the injured Oxlade-Chamberlain. The rest of the unit will probably be the same. Szczesny – Sagna, Mertesacker, Koscielny, Gibbs – Ramsey, Rosicky, Wilshere – Walcott, Giroud, Podolski. Arsenal have the second leg at home but if current form and the mood of the home crowd is anything to go by then they need to get a result in Istanbul. Any defeat could put their fate in the hands of the Court of Arbitration for Sports and the powers that be in UEFA who have to decide the course of action if Fenerbahce’s ban is upheld. In the preview I was talking about how every possible result was conceivable. The opening minutes gave the impression that this could be a comfortable win. Then there was a period when the team switched into the allow-the-opposition-back-into-the-game mode. At half time many fans must still have been confident that a result could be ground out. Anthony Taylor did his thing and Villa took the lead. For a while, even at 1-2, and then with only 10 men, it seemed like the players were fighting and a draw was possible. In the end, the worst possible outcome ensured there will be tremendous pressure on the manager and the players for foreseeable future unless they string together a run of form that is, at the moment, inconceivable. Given the lack of depth on the bench and the frustrations of the summer transfer window, it’s easy to understand why many fans instinctively linked this result with a failure to sign quality players. There is a correlation there and top class players always help a team, that much is undeniable. Similarly, there is no possible rational way to suggest this squad does not need additions. However, I find the lack of action in the transfer market to be a separate problem and don’t believe the result of this game was down to the blank slate labelled ‘New Acquisitions’. The point here is not to defend the state of affairs as they stand but to focus on the actual problems from this game, which, if you think really hard, are actually a lot more alarming than Arsenal’s inability to sign players. You might not realize this right now but if the issues we saw on the pitch are not addressed, new players are not going to make a big enough impact. With that thought in mind I don’t want to spend too much time on transfer talk in this article. Let’s stick to the events of the game. The start was, as previously noted, quite comfortable. I thought Villa were a bit tentative and lacked cohesiveness, a problem we’ll later associate with the Gunners. They set out to defend around the centre line but their pressing wasn’t coordinated across the board. The hosts found it fairly easy to move the ball around and the goal came from a fairly simple sequence of events despite the length that the ball travelled on the pitch. Wilshere’s composure and ability to turn and lose his man started it deep on the left in the Arsenal half. Rosicky held off Vlaar’s pressure and turned away from him into space, which resulted in a broken back line for the visitors. Oxlade-Chamberlain held his run and was released into acres of space. Giroud was completely free in the box and guided it in deftly. After the goal the Gunners maintained decent possession but signs of trouble were visible as early as the 10th minute when Arsenal’s 4-4-2 off-the-ball shape was visibly static as Villa exploited space down their left flank. That particular move didn’t result in a highlights-worthy moment but Lambert’s men, or boys, were slowly growing into the game. In contrast, Wenger’s wards were slowly drifting away as they couldn’t quite decide the level of risk they needed to take or the kind of intensity that had to be maintained. After the goal I don’t recall any noteworthy chance being created in the first half. This lack of clarity from a tactical point of view (often after an early lead has been taken) has been a long standing problem and has cost the team valuable points over the last couple of seasons. It paralyzes the team, creates the impression that players don’t care, and gives the opposition greater belief and momentum. Once the visitors realized they could get something from this game it was only a matter of when, not if, they were going to score. The equalizer was an unbearably soft goal to concede made worse only by its sheer predictability as Ramsey and Wilshere combined to leave a massive hole in front of the defence that sucked Koscielny in and made Agbonlahor look like Messi for a moment. The goal obviously gave Villa greater confidence and that in turn helped them with their defensive structure and solidity. They also went increasingly harder for the 50-50s with the referee seemingly keen on levelling the technical disparity between the sides. Six minutes just after the hour mark changed everything with utter incompetence being the kindest words one could choose for the Ref’s performance. A seemingly excellent tackle was deemed to be a foul and a penalty awarded to Villa with a Yellow card given to Koscielny. Soon after the Frenchman was sent off for a second bookable offence, which, while it can be considered a yellow-card offence, was the kind of challenge most officials let slide with a stern warning. There is no doubt Taylor played a starring role in Villa’s victory but blaming him for the defeat would cover over way too many cracks in the Gunner ranks. We have to wonder why Arsenal keep getting into such messy defensive situations on so frequent a basis. How can a ‘proven player’ and a ‘star acquisition’ like Cazorla be so lax as he was when Agbonlahor pinched his pocket in the build up to the second goal. From what should be a harmless position just inside the Villa half from Arsenal’s point of view, it took the Englishman three unchallenged touches to get into the hosts’ penalty area. It’s said that you make your own luck but in Arsenal’s case with a complete lack of shape or defensive awareness it was more of a matter of inviting your own misfortune. Having had the booking, one could again say Koscielny should have been a lot more careful. But while going forward in search of the equalizer the Gunners again left gaping holes in front of the defence and the Frenchman succumbed to his own aggressive temperament. A long punt forward, which was just a clearance and bounced off the back of Benteke’s head, actually fell to the rapidly advancing Weimann with no midfielder/fullback in a position to support the central defenders. I don’t know of any other club with pretentions of being one of the top European sides that gets into a tragi-comic defensive disarray this often and as easily. At the end of last season there was genuine effort and improvement in this regard but, as I’d noted at that time, it came at the cost of offensive potency and was not something Wenger was going to live with for too long. Arsenal need that calibre of collective defending AND have to find greater incision and goal threat in conjunction with that. Focus on flair and attacking desire that comes at the cost of stability at the back will often lead to situations where the team starts conceding chances and loses confidence. As we’ve seen, confidence once lost can be a very hard thing to regain. A related observation was that Arsenal did seemingly try to emulate the German 4-4-2 with the advanced midfielder pressing alongside the striker but most of the Gunners lack the tactical know-how to execute that in a ruthless and efficient manner with minimum risk. I should not single Arsenal out though, as I’d discussed here it’s an approach that the German clubs appear to have refined with years of work. Most other teams are not as efficient and effective at executing it. This won’t click for Wenger and his players any time soon and could be a very risky strategy for the short term. Despite going down to 10 men the Gunners should get credit for their fighting spirit. Rosicky and Cazorla could have brought the team level but Guzan produced quality saves. Villa’s third goal killed the game and it was again a very soft, typical Arsenal gift – Corner to the Gunners, goal/chance to the opponents. How often have we seen that?! When Cazorla took that ill-advised shot from outside the box you could see 10 Villa players in their own box and one just outside in the arc on the edge of the penalty area. The eventual goalscorer was the same guy who blocked Cazorla’s shot on the edge of the box! Arsenal had six players beyond the 18 yard line including Walcott near the corner flag, Cazorla was on the edge of the box, and two players were behind him. How does a team go from that to a clear one-v-one for the opponent against their goalkeeper within a matter of second with just one worthwhile pass?! The lack of defensive awareness and the tendency to get lost in ball-watching is beyond alarming, it’s been one of the core issues preventing Arsenal from fulfilling the potential the team otherwise has. This isn’t an issue one or two transfers can solve unless Wenger finds the perfect coach to add to his team. There are a couple of other issues that are worth discussing. Arsenal struggled against Villa’s physical challenges in this game, some of which were clearly fouls, but it wasn’t that Lambert had sent out a particularly physically imposing side. While the physicality angle was clearly visible, it wasn’t so much about physical attributes as it was about the manifestation of confidence and tactical clarity in the form of greater desire and sharpness. On the other hand, Arsenal were slower in the minds than is needed for the kind of game they want to play because of a lack of tactical clarity and this resulted in a reactionary performance rather than a proactive and dominant one. The other point is that Villa didn’t win this game by having better individuals on the pitch, they won it by having better cohesive output (with a generous dose of luck). In that sense, buying more players is not going to help Arsenal if they cannot have the whole unit on the same tactical page. Of course, one might say for that to happen a clearly comprehensible tactical blueprint must first exist but that’s a whole different can of worms that I don’t want to touch right now. Szczesny: Got lucky with the first penalty but didn’t have any control on the save as it went straight back to Benteke. Might have been sent off if the ref hadn’t played advantage. Not a confidence-inspiring display. Sagna: Took a lot of blows and a serious fall for the team’s cause, also did a decent job at left back. Did not make any sort of a meaningful offensive contribution and it might have been better if he’d stayed a little deeper. For instance, it might have been easier for him to track Weimann’s run that got Koscielny his second yellow card. Mertesacker: Had a steady enough game. Koscielny: Very unfortunate to concede the penalty and the subsequent sending off was also harsh. But he should also know how to stay on his feet, particularly after he’s been booked. This wasn’t a day he’d like to remember. Gibbs: Was looking good before he picked up that injury. It’s one of the smaller details but his presence would have helped the team’s balance. Jenkinson: He was effective in a conservative role at the start of last season and needs to go back to that. Focus on defending and get it right, keep things simple, and the rest will come later. At the moment he looks a bit out of his depth when he tries to emulate the level of involvement that Sagna offers. It couldn’t have been a great day at the office for the defenders if the team conceded three goals but the quality of officiating and the performance of the midfield does lessen the blame falling on their shoulders. Ramsey: Work rate was excellent and he was trying till the very end but I thought he should have played more horizontally in Arteta’s absence and left Wilshere more room a little further up the pitch. Rosicky: MotM, if one can be given after such a performance and result. Desire was always there and he was involved with everything Arsenal did offensively including the pre-assist for the goal, the two chances that he created for himself with clever one-twos, and the chance for Cazorla. His ability to beat the opponents in one-v-ones was excellent. Finishing could have been better. Needs to graduate from unnecessary and risky sliding tackles to a more intelligent form of defending. Wilshere: Another one whose effort cannot be questioned and he does bring something special to the side, just not on a consistently decisive basis to cover up his lack of defensive awareness and recovery pace. There is a big learning curve in front of him if he has to go from a massive potential to a truly big player. Does deserve better protection from the referee. Cazorla: Didn’t look ready but that doesn’t excuse the kind of performance he put in. Let his teammates and coaches down badly, not to mention the fans. His touch was poor, bordering on careless at times and that resulted in two turnovers that got Koscielny booked. Very bad choice to shoot from the edge of such a crowded box when a better pass down the inside channel was available. Having taken the shot he should have been alert to Luna’s movement but instead was simply watching the ball. Very disappointing from an experienced pro. The midfield did not do enough to protect the defence and they did not have enough guile, skill, or coordination to offensively compensate for their defensive lapses. There is a strong case to be made for a top class defensive signing, particularly now that Diaby and Coquelin are also not there. But that doesn’t mean the players who are there shouldn’t be doing much better. Walcott: Not his kind of game. Villa played deep and narrow for large periods and he was crowded out whenever he got near the penalty box. Nobody found him with a ball in behind with Wilshere missing the best opportunity by under-hitting a pass. He is a limited player and when the team can’t play to his strengths he will make a limited contribution. Surprising that he takes free-kicks. Giroud: Good goal, combined beautifully with Rosicky on a couple of occasions, and another player whose effort was top notch. Finishing quality has always been average and that showed in some of the half-chances that he got. Needs to bring others into the game more often but that’s a matter of developing collective instincts. Oxlade-Chamberlain: Did well to hold his run and picked his pass well for the assist. Has to make himself available more often and be involved more. This was still a very individualistic performance from a player who has the potential but lacks the knowhow to benefit from his teammates’ skills. All the three have something special to offer but they also have their own sets of limitations. In a game like this where the opponents gain confidence and hold their shape while the Gunners lose their tactical clarity, it’s always more likely that the limitations are exposed rather than their skills shining through. Again, there is a strong case to be made for buying a world class player who can make things happen but I’m not convinced there are too many around who would come to Arsenal (I don’t put Higuain in that category as he too has many limitations, Suarez might be the only (fading) hope). Subs: Podolski came on very late in the game and I’ve covered the other two above. Wenger: He will get a lot of flak for lack of signings but I’m more concerned by his inability to strike a balance between attack and defence for the duration of a season irrespective of the players he has out on the pitch. In my opinion this is linked with not having coaches from countries that are a little more advanced tactically and technically when compared to England/Britain. You are currently browsing the Desi Gunner blog archives for August, 2013.